1. Make lemon oil dressing by adding the lemon zest, lemon juice, salt and pepper and slowly whisking in the olive oil. 2. Season both sides of the Salmon with salt and pepper. 3. Place the Salmon on a hot grill for about 2-3 minutes. 4. Flip the Salmon and grill for another 2-3 minutes or until desired temperature is reached based on the thickness of the fillet. 5. Plate SMS Quinoa salad from our deli case on a plate (we prefer this salad cold, but feel free to warm it up in a skillet). 6. 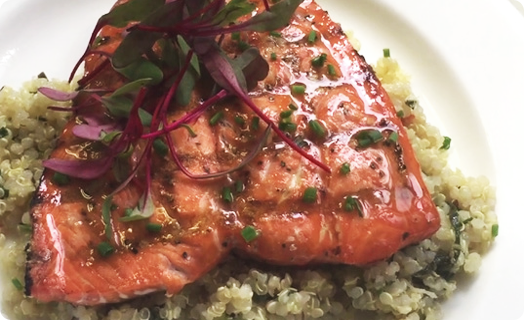 Place the Salmon on top of the quinoa and drizzle with lemon oil. 7. We suggest garnishing the fish with a pinch of chopped chives and basil on top.